I remember the first time I heard this. I was talking with a frustrated dog owner who had ‘done everything’. She had read the books. She had been on Youtube watching videos. She asked friends and neighbors how to solve her dog training problems. She had even attended some dog training classes from another trainer here in Poughkeepsie! STILL she couldn’t get the dog to walk properly on leash. STILL she couldn’t get the dog to stop barking and lunging at every other dog it saw. STILL she was tired of the dog jumping all over their guests. And she sure could have done without the chewing of their nice wooden furniture. And that’s where I got the idea for my Dog Training Boarding School. I realized that I could do private sessions with this woman and in the space of a few months we could have her problems under control. I could take the dog into my home and solve those problems in just a few weeks and make it a TON easier on her. She was busy at work during the day. When was she going to get the opportunity to work her dog through some big time dog problems? These days my Boarding School has served dogs in the Poughkeepsie area as young as small puppies all the way to adult dogs. I’ve helped fix things like house training for young dogs all the way to big time obedience, anxiety, and aggression problems for adult dogs. I don’t want my dog to go off to some stinky, old, dirty boarding kennel! No problem. Instead of having dogs go off to a boarding kennel I created a program where I limit the enrollment to just a few dogs and actually bring them to my home. They won’t spend one moment at some kennel with dozens of barking dogs and filth and disease. They’ll learn things like house training in a home. They’ll sleep indoors in comfort. They’ll be treated like one of the family. They can learn things like door manners, how to not get into the trash, how to not annoy guests, and so much more. In the space of just a few weeks I can cut down DRASTICALLY the amount of time between where your dog is and where you wish your dog was training-wise. And your dog won’t spend one moment in a run-down-smelly-full-of-dozens-of-boarding-dogs-kennel. Your dog will live in comfort and LEARN in a great environment. But I’ll miss my dog! I don’t want to be without her for a few weeks. And won’t she forget me? First off, no dog forgets their owner when they’re away for a few weeks. You’ll have to promise not to hate me. What I’m about to say I mean it from a place of wanting to help you and your dog. Whenever someone comes to me for help and says they couldn’t possibly be without their dog for any period of time I can tell you that such a dog owner is probably the BEST candidate for my Dog Training Boarding School. The reason why is that so many of our dogs get so overwhelmed by the pressure we put on them. When someone is SO attached to their dog it often means the dog feels that stress of attachment. The dog feels overwhelmed by being forced to fulfill such a strong need for the owner that the dog acts out, gets stressed, gets aggressive. For a lot of these dogs the BEST thing for them is to get a break from their owners, learn a whole new set of skills and rules, and then come back where the owner can learn some new skills. Which brings me to another question I get a lot. 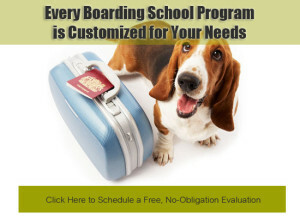 Someone told me that a Boarding School or Board and Train isn’t a great idea for dogs. They said the dog will learn to be obedient for the trainer but not for the owner. Is this true? This is a very valid concern. And in most cases, with other dog trainers, it’s very true. In fact I’ve seen other trainers do this throughout my career. They take a dog in, train it, then send it home and hope the owners fend for themselves. In my program training you, the owner, is just as critical as training the dog. The difference is that in my program I can help the owners overcome a big chunk of the work and they can simply piggyback on the training that I’ve done. In my Boarding School, when your dog is fully trained, you’ll get your Orientation Go-Home where I’ll fill you in on EVERYTHING you need to do and keep doing in order to have success. In addition, we’ll have additional sessions plus lifetime group sessions where we can make sure that long-term you are able to maintain the high level of training. I don’t want to be lazy with my dog. Shouldn’t I be the one training him? If you REALLY want to do all the work, all the heavy lifting, all the repetition, all the effort, I’m happy to work you through it. One of our other dog training programs will help you with that. But at the end of the day, I get someone to work on my car. Can I do it? Sure. But not as good as the mechanic, not as fast, and not as completely. When I need to remodel a kitchen can I figure out how to re-do everything? Probably. But why would I when someone else is FAR better at doing it than me. In the long run I recognize that paying experts to do things for me actually SAVES me money and gets it done right the first time. …then my Boarding School may be the perfect program for you. The bottom line is that there is nowhere in Poughkeepsie or surrounding areas where you can take your dog to live in such comfort, like one of the family, where he or she can get trained to such a high level in such a short period of time. 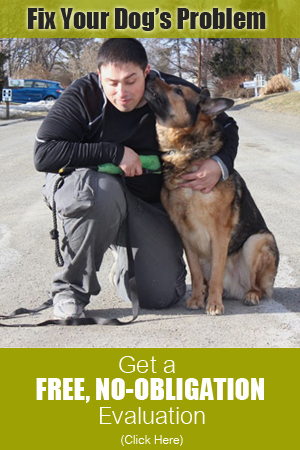 Contact us today to see if your dog is a candidate for this program and to get full program details and pricing.